Trail snowmobiles are available for double seat touring in both our Jackson Hole and Alpine Location. 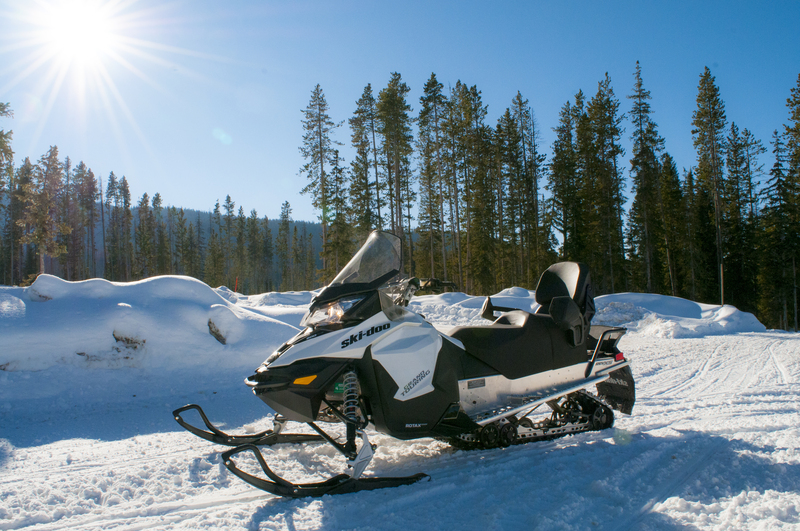 This snowmobile is ideal for customers who will be riding our extensive groomed trail networks. It is a great beginner snowmobile designed to be ridden on trail only. Trail snowmobiles can be ridden with a single driver, or with a driver and a passenger. Gear and trailer are included out of our Jackson location giving you access to multiple trail-heads including Granite Hot Springs or Togwotee. 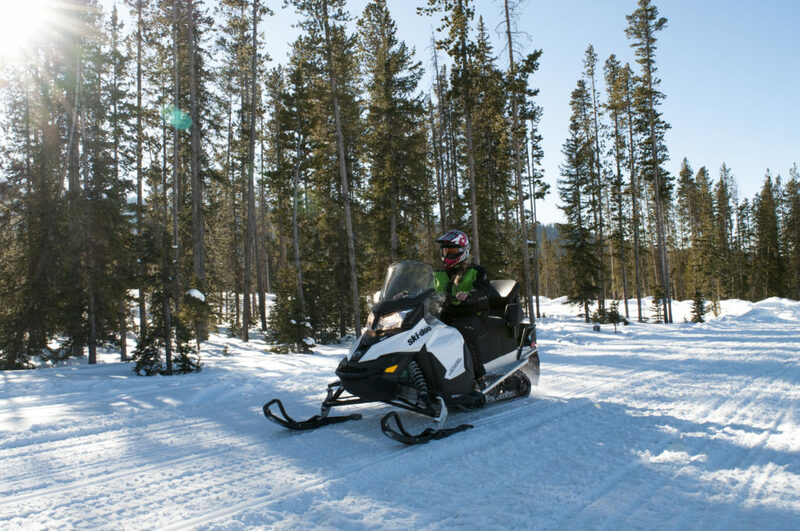 If you would prefer not to tow, load, or unload the snowmobiles we offer direct access to the Grey’s River trail system out of our office in Alpine,Wyoming. 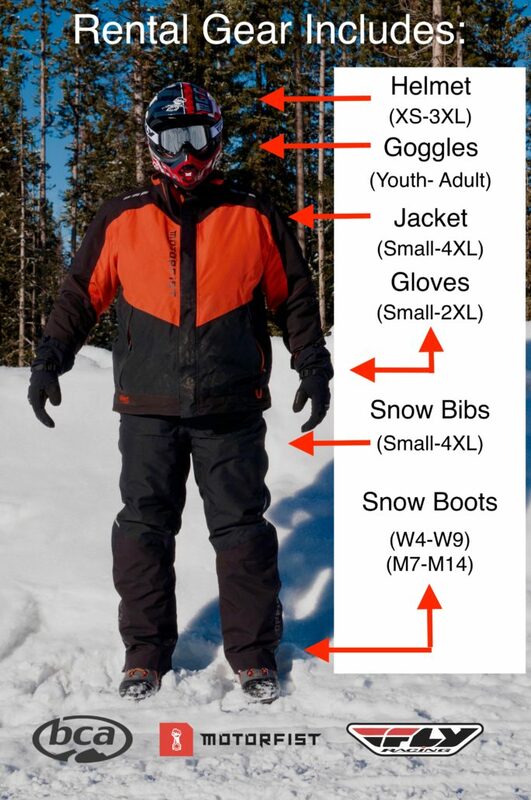 How Does a Self-Guided Snowmobile Rental Work vs. a Guided Tour? At Jackson Hole Adventure Rentals we specialize in Self-Guided Snowmobile Rentals. We provide all of the equipment, maps and directions as well as local knowledge required to send you on your own snowmobile adventure. Out of our Jackson location you will tow a trailer loaded with your equipment to one of our many trail-head options, including the popular Granite Hot Springs or the extensive trail network inside of the Bridger Teton National Forest. We can provide a complete package including a tow vehicle if you do not have a vehicle capable of towing. If you would prefer not to trailer the snowmobiles to a trail-head out of Jackson we offer our Alpine location with direct ride on access to the Grey’s River Trail system. Our Self Guided tours are great for every skill level including beginner up to expert. At Jackson Hole Adventure rentals we work hard to provide your friends and family with an affordable option to expensive guided tours. A Guided tour is a great option for groups that are looking to take less responsibility for their adventure. Guided tours typically include multiple groups of guests headed to a preset destination. They are priced per guest vs. being priced per machine and include lunch, transportation to and from the ridding area as well as fuel included.Typically guided tours are 2-3x the price of a self guided tour not including the guides tip! How Old do Drivers and Passengers Need to Be? For our Snowmobile Rentals age requirements are left to the discretion of the renter. From our experience we suggest drivers be 16 and older ridding by themselves. If they are carrying a passenger we suggest the drivers be 18 and over. For passengers we do not have a minimum age but, do suggest you have a very secure way to keep the little ones on the sled. After a long day of ridding most young ones fall asleep on the trail ride back to the vehicle. Can 3 people ride a touring sled? Two adults and a little one can fit on a touring sled but please have a way to secure the little ones on the snow machine. My son/daughter rides their own sled at home but, they are not 16 can they ride their own? We leave this up to the discretion of the parent or guardian. If under 18 they must have a parent/guardian release form signed. What is a Tow Vehicle? Age Requirements? Out of our Jackson location you are required to tow the snow machines to a trail-head. If you are traveling and do not have a vehicle that can tow we can provide one for you for $50+tax per day. Our tow vehicles are used for single day rentals only. If you plan on a multiple day rental we offer both Mid-Size and Large SUV s for towing. You must be 21 or older in order to rent a tow vehicle due to insurance reasons. If you are an international guest or do not have full coverage car insurance we offer an optional $24 per day $1000.00 deductible damage waiver on the tow vehicle. Tow vehicles will leave full of fuel and will need to be returned fully fueled. Our tow vehicles are typically a Suburban or a crew cab truck. Our Tow vehicles can tow from 1-snow machine up to 6 snow machines. What is the Difference between the National Park and National Forest? The National Forest provides the most access with the least amount of restrictions for self-guided snow machine rentals. For our rentals out of Jackson and Alpine our trail-heads are located inside of the Bridger-Teton National Forest system. At both locations we provide detailed maps and directions based on your preferred ridding area. Jackson Hole Adventure Rentals offers two locations to better serve our guests. Our Jackson Hole location offers great access to both the Granite Hot Springs trail system and the extensive trail network at Togwotee. Out of our Jackson location you are required to tow the snow machines to the trail systems. Our shop is located on the south side of town in Jackson Hole between the Albertsons and Smiths grocery stores. The Granite Hot Springs trail system is located 22 miles south of our shop. Togwotee is located 50 miles north of our shop. We offer only full day rentals out of our Jackson location. We do this as the 1/2 day option would not give you enough time to trailer the snow machines to the trail system and have a productive ride. Our shop in Alpine Wyoming is located a mile away from the Grey’s River Trail system inside the Bridger Teton National Forest.You can ride directly out of our shop onto a trail system. We offer both 1/2 and full day options out of this location due to the shop being so close to the trail head. This is a great option for those that would prefer not to trailer, load, or unload the the snow machines. Alpine is located 35 miles south of Jackson with a beautiful drive through the Snake River Canyon. Both locations offer a wide variety of skill level ridding. From beginner to experienced mountain ridding our customer service agents can point you in the right direction. Click here for a Video on how to Unload the Snow Machines! Click Here for a Video on How to Load Your Snow Machines! Ski Doo 900 Ace Touring 2-person (4-stroke – BAT Compliant). Copyright © 2017 Jackson Hole Adventure, All rights reserved.